It’s a great time to buy a diesel here in the U.S. as Mercedes announces their new 2014 E250 BlueTEC sedan that gets an astounding 45 mpg. It seems like we here about these great diesel cars with outstanding fuel mileage, but they are only for European consumption. But for once U.S. buyers will be able to buy a great Mercedes car, powered by a diesel powerplant, that is very fuel-efficient. It’s not only fuel-efficient, but the newest Mercedes-Benz E-Class sedan achieves best-in-class fuel efficiency for any mid-size luxury sedan. It also achieves best-in-class fuel efficiency for the entire industry in the mid-size size range. That’s a big deal here in the U.S. as automakers have not introduced many diesels here because of the high cost of meeting exhaust emission regulations. But Mercedes has solved that problem in all 50 U.S. states. The Mercedes BlueTEC system uses AdBlue injection to make the diesel as clean as a state-of-the-art gasoline engine. A water-based urea solution (AdBlue) is metered into the exhaust in small quantities converting nitrogen oxides into harmless nitrogen and water in a downstream catalytic converter. Customers won’t have to add the solution to the fuel, as it only has to refilled during routine scheduled maintenance. This is the most effective method of exhaust gas after-treatment currently available. Now we will see Mercedes introducing more great high-mileage efficient diesels here in the U.S. The new 2014 E250 BlueTEC sedan will likely be the first of many and it’s good news. It will also be the first diesel Mercedes E-Class to be available with optional 4MATIC all-wheel drive. Even with the less efficient all-wheel-drive, fuel mileage numbers are still impressive at 42 mpg highway and 27 in the city. No other diesel sedan offers a better EPA fuel economy highway estimate. Mercedes is on the leading edge of diesel technology and has been for decades. The new E250 BlueTEC sedan will be powered by a highly-efficient turbo four-cylinder engine. In the past, four-cylinder diesels have had inherent vibration issues and thus a bad reputation to go with it. But Mercedes engineers have solved the problem. They use an all-aluminum engine that utilizes four valves per cylinder and dual overhead camshafts with vane-type variable valve timing. To smooth out the annoying vibration, Mercedes uses two Lanchester balance shafts spinning at twice the crankshaft speed in sophisticated, low-friction roller bearings. The small diesel will produce 195 hp and an impressive 369 lb-ft of torque. The two-stage turbocharger combined with all that torque should produce outstanding performance in the mid-size luxury sedan. How much does it cost? The new 2014 2014 E250 BlueTEC sedan with rear-wheel-drive starts at $51,400. 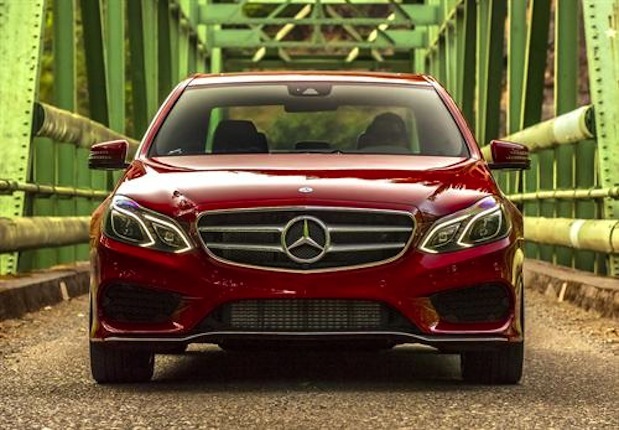 E250 BlueTEC sedan with 4MATIC all-wheel-drive starts at $53,900. The new E-Class will also be available in a Coupe, Hybrid sedan, 4MATIC Wagon, E350 Cabriolet and E63 AMG sedan and E63 AMG S-Model sedan and wagon variants. Look for the new fuel-efficient E-Class BlueTEC in U.S. showrooms this month. Stay tuned to Torque News for the latest efficient Mercedes BlueTEC diesel news.